Memorize scripture in a powerful way. We want to invite you to be part of something that will change your life! You've heard of fruit of the month, flower of the month and even salami of the month clubs...but have you ever heard of a Chapter-A-Month Club? 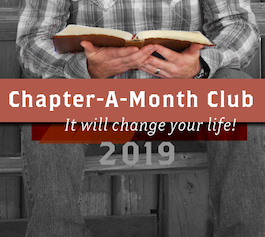 The Chapter-A-Month Club is an exciting way to memorize important Scripture through a collaborative effort that provides encouragement and accountability. 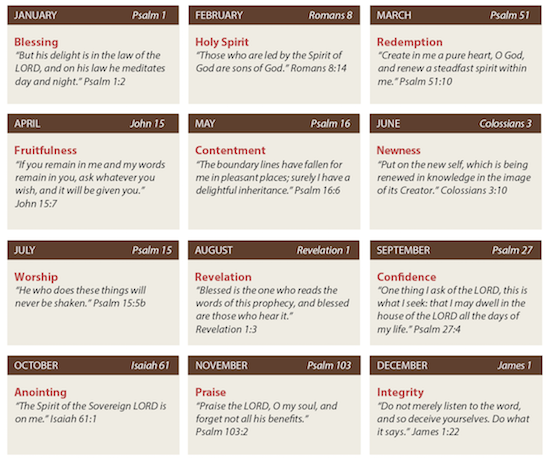 Each year we focus on a new theme and every month hundreds are memorizing a potent chapter of scripture. Just look at the list of scriptures below! We will send monthly insights from Fred Hartley to all who sign up. These insights are not only about the chapter we are memorizing, but also into the whole art of memorizing and meditating on God's word. The only spiritual discipline for which God promises prosperity and success is meditating on His word. Why not join us? It's a monthly gift that's free and will stay with you forever ... unlike the salami!